I wouldn’t call myself a huge David Spade fan (does anyone?) but I liked Just Shoot Me, and movies like The Benchwarmers and Joe Dirt are always fun. And then there’s Tommy Boy. My husband and I love Tommy Boy (LOVE TOMMY BOY), and while Chris Farley gets all the laughs, he couldn’t do it without Spade as his straight man. 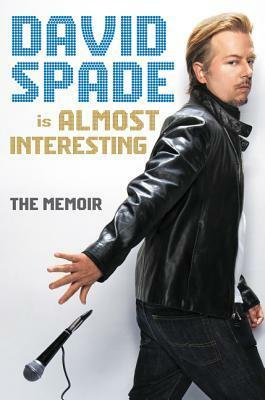 Almost Interesting is your pretty basic celebrity memoir. Spade talks about his childhood (two brothers, lots of broken bones and concussions), his time at school (picked on a lot for being a tiny little man) and how he discovered the comedy bug. He talks about breaking into the business (slowly, so slowly) and his time at SNL. The more I read about people who’ve worked at SNL (especially the writers), the more I’m glad I’ve never felt the desire to work there. It sounds like a beating. But of course, SNL is how he met Farley, and the stories about their friendship and the behind-the-scenes action makes this book worth the read. Now, if you don’t feel the sort of insane blind affection that I do for Chris Farley (see also: John Candy, John Belushi), it might not be worth it for you. But I loved hearing about Farley, and it’s so obvious that Spade loved him, too. He talks about how much Farley influenced him, and made him a better writer, actor, comedian. This particular quote hit me hard. You wouldn’t really expect that from David Spade, huh? Share the post "Worth reading for the Chris Farley antics alone"